This pattern is available in print for $3.00. 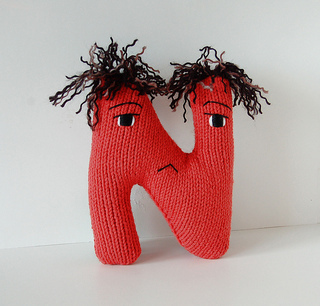 Nicholas is fun to make and a quick knit! Simply knit two halves and sew them together with some stuffing inside. Then add facial features and hair to create a unique personality; you can follow my directions, or feel free to “knoodle” with new hair styles and expressions. When you are finished knitting them, using the recommended materials, your Alphabet People will be approximately 6” (15cm) tall. Nicholas is an original pattern by The Knit Knoodler.